Why does the world need a self-lacing shoe? Haven’t you heard of Velcro? How will you tie your shoes when the Wi-Fi is down? A sentiment followed up quickly with callouts to the Twitter account @internetofshit, which highlights devices that are unnecessarily burdened with wirelessly connected bloatware features. To be fair, this response is exactly the same one that Nike’s first self-lacing model received. But this time, the announcement also came right on the heels of CES, the natural home of needless electronic gadgets. People are so burned out by smart toilets that they were not ready to hear about shoes gaining a connected hardware component. And, honestly, I get it. 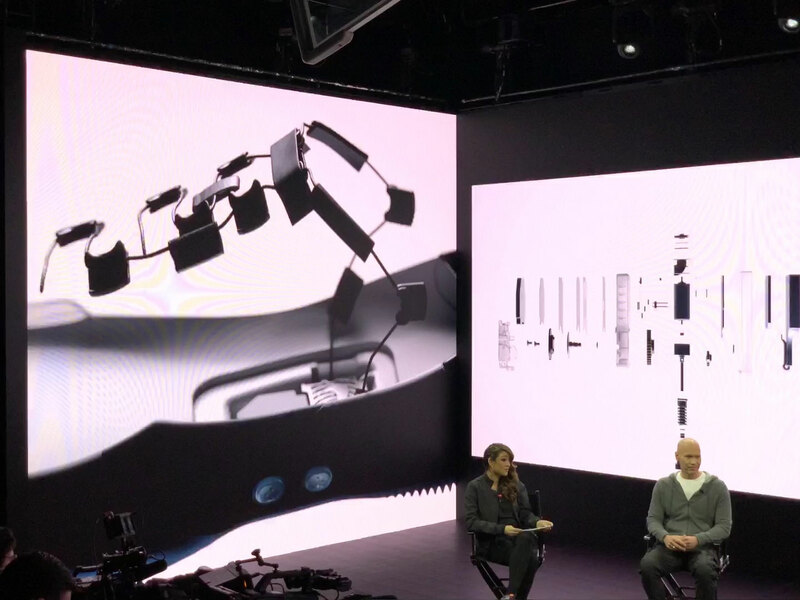 It’s a hard sell to say that the solution to a laceless design is to add about half of the hardware that goes into your smartphone and the ability to talk to your shoes with your phone. But the Adapt BB is really working on two levels, and to tease out whether there is a there there when it comes to connected shoes, you have to consider the context. For a while now, the Holy Grail of shoe design has been the hunt for a truly “laceless lockdown” shoe for basketball applications. Not just a lack of laces, but enhanced lockdown — a fit that borders on custom-molded, preventing a player’s foot from moving around inside a shoe even in extreme cut or stop-short situations. Think cornering ability in a car coupled with adjustable seats — it doesn’t matter how hard the car can turn if it throws you all around the cabin. Nike’s approach to this effectively uses a single cord and a motor to replace a traditional set of laces. Nike rival Adidas is pursuing the goal in a different way, using interwoven textiles and self-tightening weaves in its N3XT L3V3L basketball shoe. Regardless of approach, there are genuine, real benefits to trying to eliminate or evolve laces. The casual observer crapping on auto lacing may not realize that lacing and lockdown are actually an enormous problem for many pro players. The typical player has their shoes laced in the locker room and then leaves them laced that way the whole game unless they come off the court for some reason and have them adjusted. At times, they even have a coach take care of lacing for them, because it’s impossible to get enough torsion on their own to achieve full lockdown in their game shoes. Then, that level of tightness is kept for hours as they play the game, allowing for no relief even on the sidelines. Not the best for players that already have bone weakness, and, honestly, not good for anyone, as blood flow aids recovery and prevents injury. 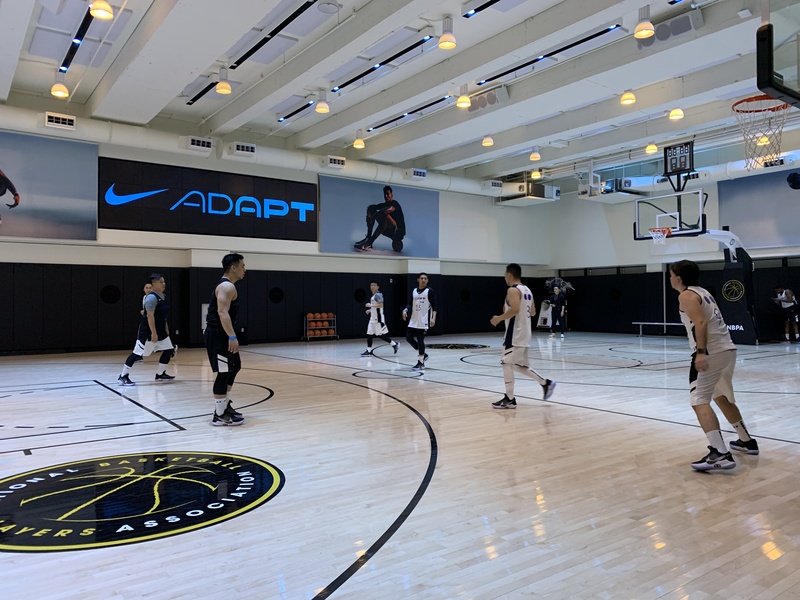 Nike says it commissioned an independent university study on the effectiveness of the Adapt BB system on lockdown that showed a 40 percent improvement and has testimonials from a host of (admittedly Nike-solicited or sponsored) athletes who have had a chance to try them. They all say the same thing: These shoes really do help achieve better lockdown, and the convenience of being able to set one or many pre-set lacing tightnesses and then choose to engage or disengage at will is a real benefit. We’ll get into the long-term plans, but it’s important to remember that the market for this first model of Adapt is professional and semi-pro athletes. Though many consumers will buy them, Nike’s plans for casual shoes on the Adapt platform are down the road and these aren’t it, chief. Still, those long-term plans are what make the whole thing more exciting than, hey, here’s a new pro tool for pros. First, though, let’s talk about the hardware. The core of the Adapt BB and the device that makes Nike’s use of the much-maligned platform buzzword possible is a plastic rectangle that sits under the arch of the foot inside the shoes. Branded with the traditional swoosh, it contains a worm drive engine with back stop protection that coils the laces to the desired tightness then locks them mechanically to prevent slippage during play. This, and the single wire that tracks through a maze of anchors over and up the foot falls under the umbrella of what Nike is calling FitAdapt tech. It’s the auto-fit component of the smart shoe stuff that Adapt BB can do. There is, of course, a battery as well and a coil to enable induction charging from the shoe’s charging plate. And yes, a Bluetooth module to allow it to communicate with your phone. The other stuff inside this box is fascinating, though, and is completely un-used at the shoe’s launch. But let’s dance around that for a minute. The midsole is made of Nike’s Cushlon foam, a denser foam that doesn’t compress as much as some of its newer offerings like Zoom. This allows the module to sit under foot, recessed a few millimeters under the sole insert and invisible to a wearer’s foot. The insole is also made of a new sockliner foam, which focuses on impact distribution, spreading any point impacts from the box in the midsole over the surface of the foot. Simply put: you can’t feel the motor. 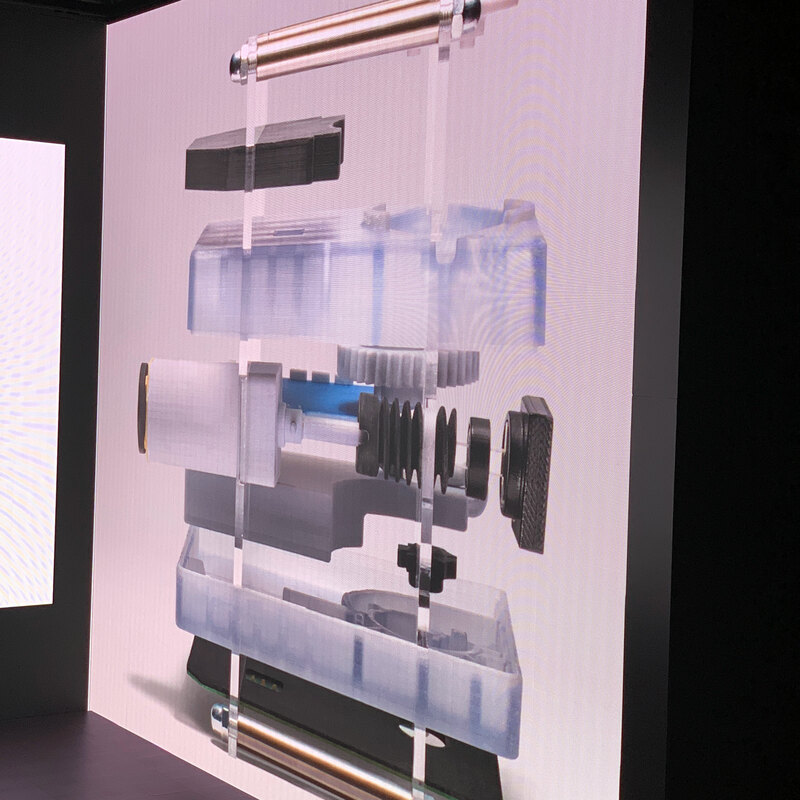 Narissa Chang, Lead Mechanical Engineer and Jordan Rice, Senior Director of Smart Systems Engineering at Nike, explained that they conducted a massive amount of testing to make sure that the module continued to work in damp, high-impact conditions. The spec I was given was that the motor should easily outlast the shoe, so it shouldn’t be the point of failure. The outsole is grippy, with great traction behavior and sharp cornering. I was able to wear test the shoe on two consecutive days and played a pickup game with other media folks on day two in them. The details of my performance will remain undisclosed, but the shoes performed admirably. Here’s how the system works. You slip your foot into the shoe. If you’ve already set up a lace tightness, a new magnetic system (no longer pressure-based like the first Adapt) senses your foot’s presence and tightens them. That’s it. 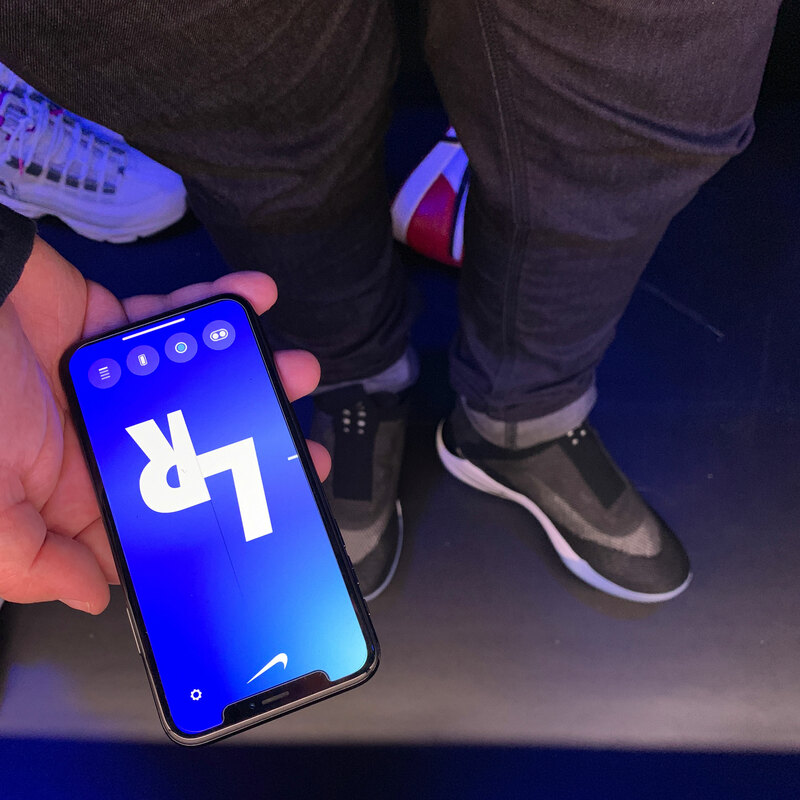 If it’s your first run, you pair the shoes to the Adapt BB app, which will be on the App Store and Google Play Store. When you pair, you’re linking your shoes directly to your Nike+ account, so there is no chance of anyone either connecting to or controlling your shoes. No log-in, no control via the app. 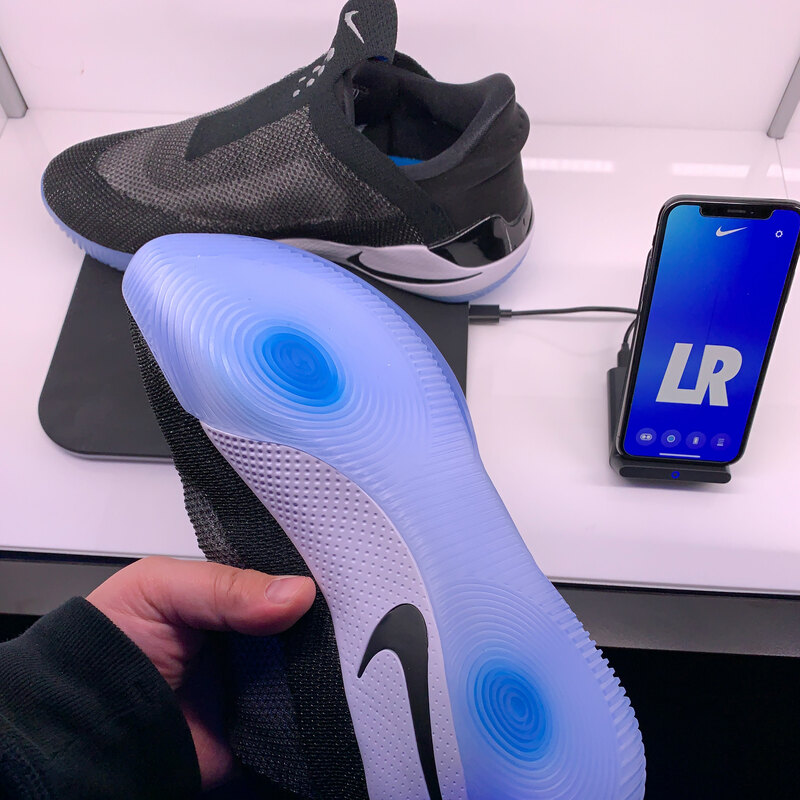 Once the app is paired you’re able to choose a color to identify your shoes, which will appear in the LEDs that back the control buttons on the lateral side of the midsole, just aft of the mild outrigger. The LEDs serve to ID your shoes and offer customizability but also to identify which of your lacing profiles are set. The app, in a feature that is launching in a couple of weeks, allows you to set up multiple tightness levels that you can switch between with a tap. If, however, you want to use the shoes free of the app you can. If your foot is in the shoe you can single tap to jump to desired tightness or tap and hold a button to bump them back to “wide open.” You can also make micro adjustments by tapping the buttons. If your foot remains in the shoe it will eventually tighten back down due to the auto-lacing mechanic sensing your foot is still inside, but I’m hoping you can change that behavior for rest periods. This means that if an athlete is on the court, they can adjust their shoes by button on the go. This is one of those fundamental things that a lot of the Twitter Snark brigade was missing — this was essentially an impossibility for players up until this point. Precisely adjusting the lacing all the way up to full lockdown was something that typically required a coach to do. This isn’t hurriedly re-lacing to finish out a period, it’s getting the exact fit for right now on the court. Players, for example, will tell you that after about a half hour on the court, their feet will swell, sometimes up to a half size. This changes their comfort level significantly. So they have a choice: either play with their shoes too loose for 30 minutes or tighten them enough to be painful by halftime. Not with an adjustable shoe. The buttons, it should be noted, are pretty much mandatory in the NBA where phones are outlawed on the bench. The shoe and tech, however, is approved for court play and Jason Tatum debuted them last night in the Celtics/Raptors game. 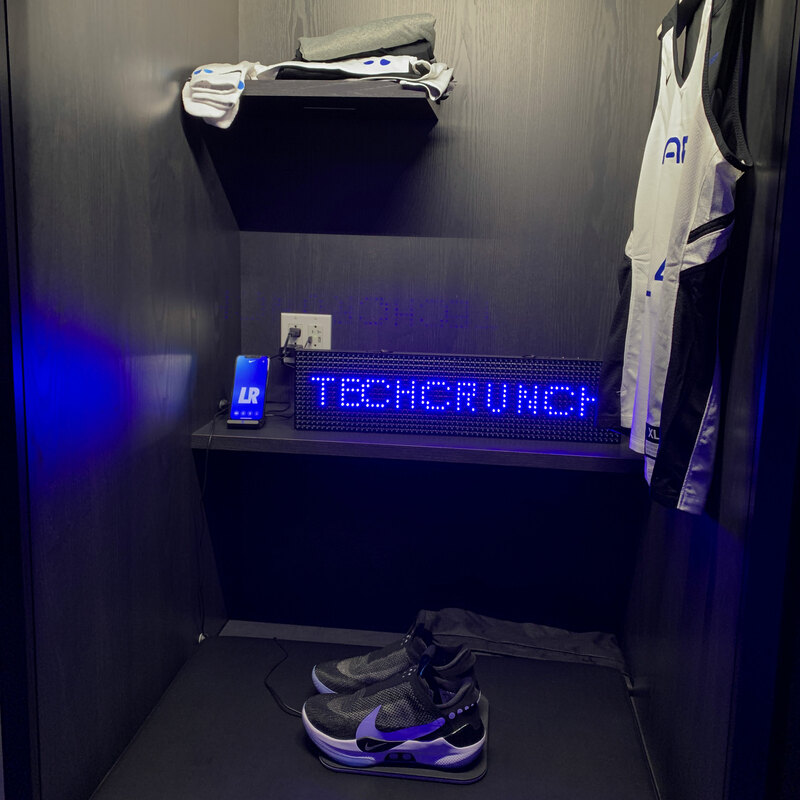 But outside of the immediate benefits for athletes, the hardware also telegraphs an interesting future for Nike’s connected future. The other components of the lace engine include things that you’re probably already carrying including a 3D gyroscope and accelerometers that measure multiple axes. This shoe can, if it chooses, determine things like gait, foot strike pressure, pace and even in-air motion of your feet. Imagine, if you will, a coach that tells you you’re putting a foot too far forward or back during a layup or launching too late, or leaning back too far. This is possible with the hardware Nike already has on board. And it is telling that none of it is enabled up front. Though it can do all of these things, it’s not doing them now. Nike feels that the solid benefit to pros of an adjustable lacing system that can achieve industry-standard-or-better lockdown is enough to launch this. Everything else it can do is gravy and scene-setting for Nike’s future plans. Though they are predictably pretty reluctant to state future plans, plenty of hints are dropped at more connected shoes, clothing that connects to them and devices like smart watches and headphones that can work in concert to give you feedback about how your body is performing. One other core component that Avar notes could become a focus of Adapt is cushioning. “You can imagine adaptive cushioning in the future, obviously. So when we say platform we’re thinking holistically about the performance attributes of footwear and also starting to think about apparel. Nike says battery life clocks in at between 10-14 days with multiple adjustments per day. The shoe always reserves 5 percent battery to unlace the shoes to get you out. Charging takes under three hours with the wireless charging mat to full. There is currently no Apple Watch app, but Nike says they’ve been thinking about it. I was able to wear test the Adapt BB over two days in New York, including doing some warmup and playing a pickup game with media at the National Basketball Player’s Association court. The comfort level, I’m pleased to say, is well within bounds for a performance shoe. I’ve worn easily north of 1,000 different pairs of sneakers in just the past couple of years and I would have no problem wearing these off the court as well as on. It’s absolutely a ‘pro fit’, with a grippy, enclosed feel that facilitates cutting and cornering. This shoe does not have the comfort level of a casual or lifestyle sneaker, by design, but Nike says it is bringing Adapt to those categories in 2019 as well. I’m happy to say that these shoes are just wearable, period, even for someone with a wide foot and high instep. The Adapt 1.0, by comparison, were heavy, stiff and rough to wear for feet outside the norm. Aside from the Cushlon we mentioned and the crispy clear outsole, there are a few interesting design details worth mentioning. To me, the shoe is designed to evoke designs of Nike basketball past. The overall silhouette evokes the Kobe AD, which makes sense given Nike vice president and creative director of innovation Eric Avar’s work with Kobe and his line of shoes. I also notice a shiny heel segment that throws off hints of the Jordan 11’s patent leather support band. Avar also calls out the swoosh within a swoosh, saying that it’s meant to evoke the human within the shoe, being enhanced by the Adapt system. It’s a good looking shoe. Intentionally designed to give off Nike basketball vibes, while still holding appeal for a set of early adopter enthusiasts that will likely wear them on and off the court. One of the most exciting ancillary effects of a self-lacing shoe is assistance that it can give people with fine motor skills or mobility issues. Having a shoe that can tie itself goes right from a first-world problem to a genuinely life-enhancing feature when you look at it through the lens of accessibility. First up, no, I don’t think that the entire Adapt project is some sort of accessibility Trojan horse and that they’re doing all of this to let people who can’t tie their shoes for reasons out of their control wear dope kicks. But it’s absolutely bound to be a result of the platform, including its self-lacing feature, trickling down through the lifestyle and casual categories. Yes, this first pair is $350, but that’s already down from $750 from the Adapt 1.0. That’s quite the curve and it will continue to bottom out with scale. I asked Chang and Rice specifically about whether accessibility was a part of their design and engineering conversation. They said that the Adapt 1.0 was just an experiment to see if they could commercialize this laceless design but that the moment it hit the public they got tons of feedback about how great this could be for accessibility. And the engineering team works directly next to the department inside Nike that works on athletes of all levels of ability and enablement. So, while this is not the purpose of Adapt, I’m hoping that it will be an awesome effect of it succeeding. Provided it does, of course. 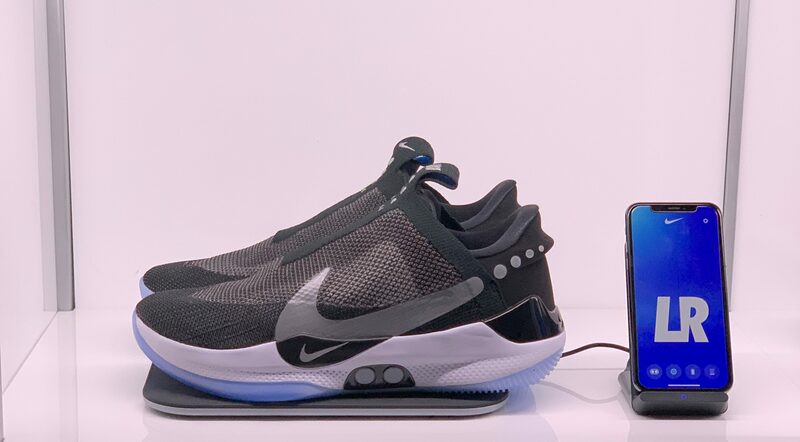 Performance benefits of a connected suite of Nike and Nike-compatible devices are, frankly, a safe bet. Nike is in the envied position of being an established purveyor of performance gear and sees a future in being able to offer some value here that will sell a lot of product. But I think even this unrealized future of a connected performance suite is too narrow. I’ve written before about Apple’s position in the market and the potential it has to turn its devices into biometric enablers of identity. Imagine a shoe that automatically pays as you cross the boundary of a toll booth or bus door. A bike that locks unless your cleats are in it. A shirt that can have an opt-in chat with your health app of choice and give a real window into hydration. Nike is billing the Adapt BB as the first shoe that’s software upgradeable. Though there have been other electronically enabled shoes in the past, this is the first time that you could conceivably see one of these being able to get better before the natural course of time and wear makes them get worse. Pro athletes change their shoes sometimes as quick as one pair per game. The pro-am category though, could conceivably see a shoe they wear for a year or more gain features and abilities over time. Seeing a shoe get the benefits of a piece of upgradeable software defines, I believe, a major shift in the way that we think about clothing as a consumable and “degrade only” category. Buying a piece of clothing that gets better with time isn’t new, obviously, as leather boots and other animal skin clothing tends to take some time to break in before it even fits right. But outside of animal products, it’s rare — and a first, as far as I’m concerned, in performance wear. It’s imperative that they tell the story carefully, following the strategy of providing solid, real-world benefits that feel not just as good but better than the analogue alternative. It’s also mandatory that Nike takes its stewardship of user data seriously. It’s a good sign that they mentioned responsible data use a lot during formal presentations and my informal chats across the design, digital and engineering teams. Apple’s philosophy toward data handling was mentioned — and it makes sense as Nike has a similar arrangement with customers. You may give them data but they’re providing you a product for profit. It does not benefit them to misuse or misrepresent the way they might use future data that they read from your shoes or clothing. Examining incentives is important in a world where we’re getting closer to a high-fidelity, portable, digital profile without having yet decided who owns that profile — us or the companies that gather data on it. But you have to walk the walk. As Nike rolls out the Adapt platform, it will be important to keep an eye on whether they are good stewards of user data. One advantage Nike could and should leverage in its pursuit of creating actually useful smart clothing is its conduit into culture. This conduit takes many shapes but includes sneakerheads, basketball fans, hip hop culture and art/fashion collaborators. There are dozens of examples of failed attempts to make wearable smart clothing cool, functional and adopted at scale. In most of those cases, however, the efforts have come from companies without the ability to connect culture and tech with a strong organic link. The Culture, as an organism, has an incredibly strong BS detector. It doesn’t matter how good the tech is or how disruptive a company’s business model — if it’s trying to create a true shift in consumer behavior (that’s exactly what Nike is attempting) then it has to partner with culture. That can be via communities like the sneaker enthusiast early adopters or through institutions with rabid in-tune fan bases like the NBA or collaborators like fashion upstarts and artists who lend authenticity and a feeling of nowness to the product. It’s one of the cardinal blind spots that remains in Silicon Valley, which views culture through the lens of engineering rather than art or fashion. It’s a huge reason why there are so many corpses of companies that have attempted this before. That and many of them did not have the advantage of a mature-to-the-point-of-saturation smartphone supply chain to take advantage of. 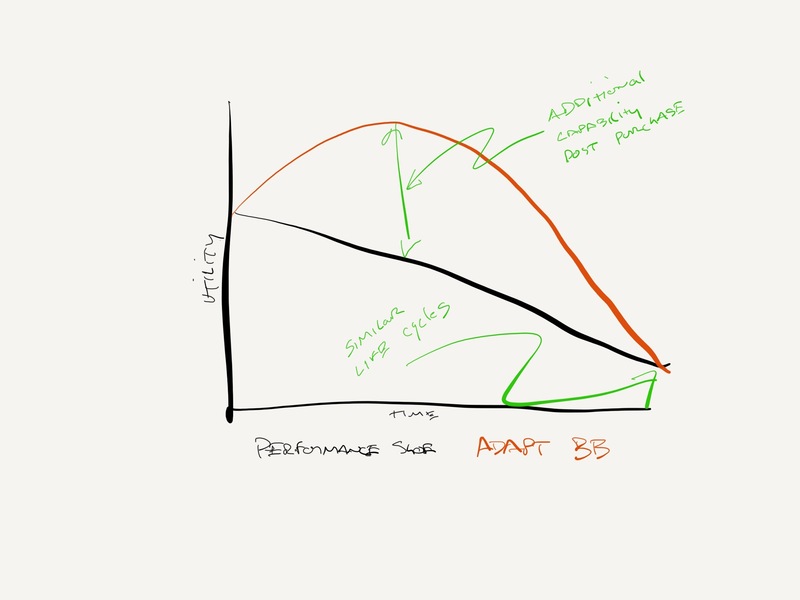 Any time I write about passive connectivity I get a polarized response, not unlike the one people have had so far for the Adapt BB. It’s either a sign that we’re getting lazy, complacent or not paranoid enough, or it’s an amazing feat that points toward utopia. Neither one is likely to be totally true, though I would argue that we need to look at these things in a way that attempts to engage, discuss and influence them toward the positive end of the spectrum. If the past decade has taught us anything, it’s that the future is going to happen, and if we don’t have the belief that it can be good, backed up with active participation in making it happen, then we’re doomed to more of the same. In the near term, Nike has what it seems could be a lucrative opportunity to provide solid value for customers based on a portfolio of devices that enhance active lifestyles. In the long term, the company has a tougher but potentially much more impactful chance to outline a connected, wearable framework that rests on an honest relationship with customers and strong data stewardship. There are only a handful of companies on earth that have the scale, execution ability and incentive structure to make this happen. Nike is one of them. This will be interesting.